Since it looks like we survived the predicted apocalypse it’s time to look forward, and figure out what to buy to get rich in 2013. Some of my fellow bloggers already published a few lists with boring, well capitalized and undervalued stocks that could perform well next year. But we all know that that’s not going to cut it if you want to make serious money. To hit it big you need to be investing in the next hot thing, and what’s hotter than nanotechnology?!?! The Company is pursuing opportunities for global market leadership in the field of nanotechnology, a sector with the prospect of $2.6 trillion in global revenues – representing 15 per cent of all projected global manufacturing – by 2014. Looks like a plan that can’t fail. With such a tight schedule I image that I’m rich in time for the summer holidays so I can finally buy my own tropical island (surprisingly affordable: for a half million USD you got your own little island). Or maybe I should start with a zombie proof house: better safe than sorry. Or an even better plan: simply do both! No position. If you are stupid enough to buy this BS you deserve to lose your money. This entry was posted in Off Topic and tagged CTLE on December 21, 2012 by Alpha Vulture. 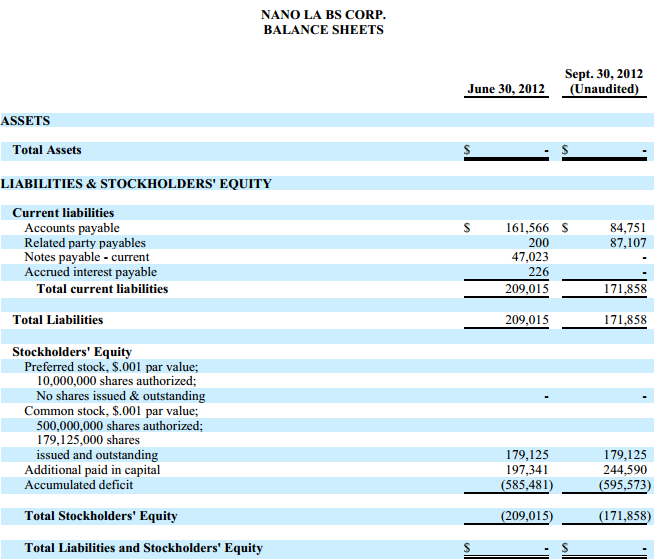 Didn’t realize it was a joke, until I reached the balance sheet & wondered why there was a misprint…oh, right..! Really should be an easy & profitable investing life to just short crap like this – except…it often seems like there’s people who can stay dumber much longer than you can stay committed to a bad short position!